→ Poka-yoke means "error proofing" or "mistake proofing". 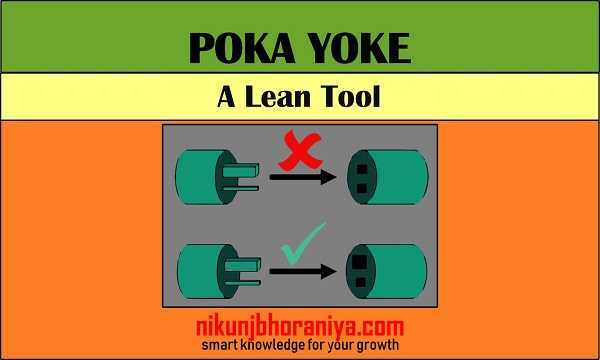 → Poka-yoke came from the word "Poka" and "Yokeru". → Poka-yoke is a Japanese term that means "error proofing" or "mistake proofing". → It is any mechanism in any process that helps for "mistake-proofing" or "error proofing". → This word came from the word "Poka" and "Yokeru". 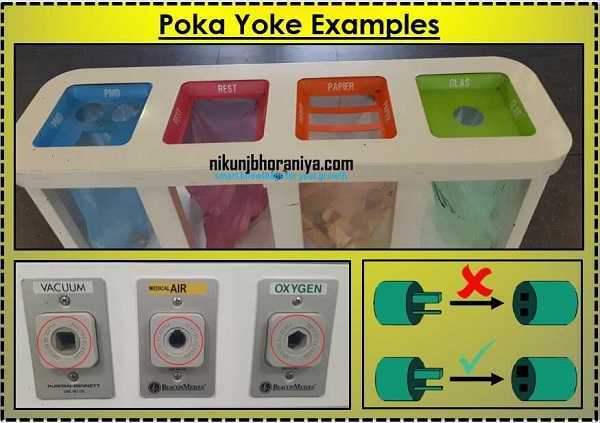 → Poka means "Mistakes" and Yokeru means "to avoid"
→ We can eliminate product defects by Poka-yoke either preventing it, correcting it or detecting is as they occur. → This concept was adopted, by Shigeo Shingo as part of the Toyota Production System. → It was originally described as baka-yoke then it was changed to the poka-yoke. → Shigeo Shingo used the word "Poka-yoke" in the 1960s for prevention of human error during industrial processes design. → A simple example is when we start a car having a manual gearbox, we must have to press on the clutch pedal before starting. → Seat Belt wearing Indicator. → Auto-locking of the door at the certain speed of the car. → It can be implemented at any step of the manufacturing process. → We should implement Poka-yoke, where the possibility of something can go wrong or an error can be made. → The contact method identifies defects using a part’s shape, color, size, other physical attributes. → It can also include limit switches and proximity sensors. → When certain movements are not made then the Poka-yoke inform the operator this method is known as the constant number (or fixed-value) method. → Counters can be used for this at each step of the process as necessary. 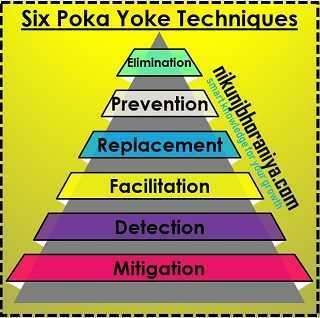 → In this method, the Poka-yoke ensure the sequence fo the process step before moving to the next step. → This is known as the sequence (or motion step) method. → The sequence method is not allowing the mistake to be made in the first place. → Example of sequence method is color coding and tagging and this parameter are checked at each step before moving forward. → Make a robust process design for zero defect manufacturing. → For any improvement, brainstorm with the teams so we can use their knowledge and experience to implement our improvement. → Use various problem-solving methodology or techniques for reducing defect and decrease defect to zero. → Eliminate the root cause of any problem by implementing poka-yoke. → Make the process very effective to perform functions correctly in the first time. → Identify all non-value added decision and activity and eliminate it. → We can not get 100% result in a single try. → So, implement improvement actions immediately and focus on continual improvements so we can get a 100% result. → If elimination is not possible the second option is Replacement. → If the above two methods are not possible then the 3rd option is prevention. → Change product or process (as applicable) so that mistake is prevented. → Prevention is a physical barrier to prevent undesired action. → If the above three methods are not possible then the 4th option is facilitation. → Facilitation is to help someone for taking the right decision. → If the above four methods are not possible then the 5th option is facilitation. → If the above five methods are not possible then the 6th option is mitigation. → Mitigation is to minimize the effects of mistakes or failure.